The Tre Mercarti Boi-ing is a Mono sink mixer with an adjustable pull out spout that improves ease of use. The function is controlled by a single lever. All Tre Mercati products are tested before despatch and our confidence is such that we offer a 10 year guarantee for any defects in manufacture. Chrome plate finishes also carry a 10 year guarantee. Q. What are dimension of the tap base? I was told to buy a tap with the 35mm base. Hi, the base of the Tre Mercati Boi-ing Mono Sink Mixer is 50mm. Thanks. Hi Nick, the manufacturer advise that it will work between 0.5 - 3 bar. The ideal Bar is 2. I hope this helps! Q. What is the diameter of the base that is fixed to the kitchen sink? 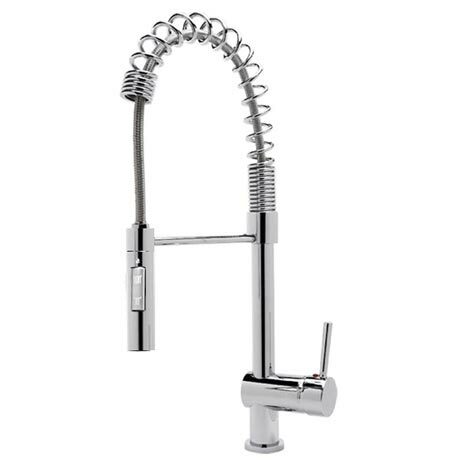 Hi, yes all fixings and flexi pipes are included with the Tre Mercati Mono Sink Mixer. Thanks. Q. Is it a swivel arm or fixed ? The Tre Mercati Boi-ing has a swivel arm. The minimum bar pressure will need to be at least 1.bar. Bought this tap to replace a year old one that we bought on eBay,that failed beyond repair. What a difference, this fabulous tap works like a dream, superb quality, easy to fit and feels solid and well built. So far, we're very pleased. This is the biggest tap ever! I love it. Looks so modern but it is a tall tap and a feature to my kitchen. Excellent value for money. This tap completes our beautiful and modern kitchen. A lovely, modern tap which was exactly what I was looking for. Definitely value for money and I couldn't fault the delivery service. I would definitely buy from Victorian Plumbing again. I will recommend them to all my friends. Overall the product is good. The tap has two function, spray and normal.However I have only one disappointment which is that the website let me order this tap when it was not in stock at all. Then had to wait for two weeks to receive the item. This a great product, which I would highly recommend. Per one other reviewer's comments, it is quite tall (make sure you measure), but it looks great and is of a really good quality. I hadn't realised that there are 2 spray settings, which is an added bonus. Does the job really well. A Victorian Plumbing provided a very good service. Very prompt delivery. A great addition to anybody's kitchen. Smart, elegant and very practical.